Our indicator use the same parameters as the well known trader M.Mostafa Belkhayate the inventor of the indicator, allow the use of buffers for your EA and allow notification for every closed bar beyond lower or upper limit to your phone. 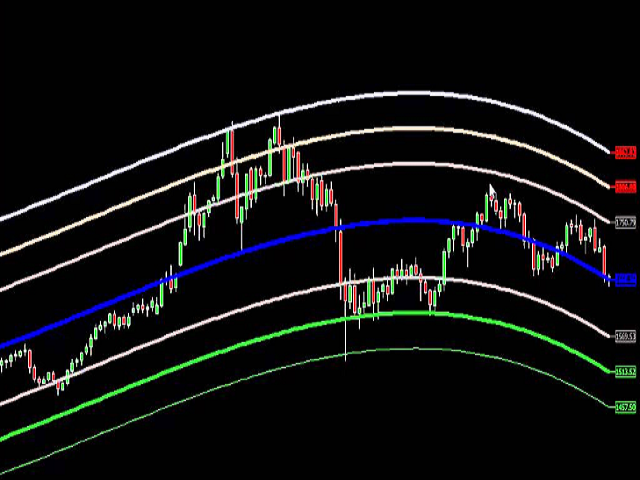 The idea is to buy between or beyond the Green lines to reach the center blue line, and sell between or beyond the red lines to reach the center blue line. Push notification for signals : true or false: Notification to your mobile in case of closed bar beyond limits. Alert notification for signals : true or false: Alert in your terminal in case of closed bar beyond limits. 0: Center blue line values. 1: Upper Line 1 values ,Red. 2: Upper Line 2 values ,Red. 3: Upper Line 3 values,Red. 4: Lower Line 1 values,Green. 5: Lower Line 2 values,Green. 6: Lower Line 3 values,Green.